The final doll in my final university project. I planned on seven, but really, when it came down to it, my obsession to the little details just took the time and I think I’d rather do four dolls really well, than rush seven. I’ve even used some modern technologies, sewable electronics to make a working head lamp. 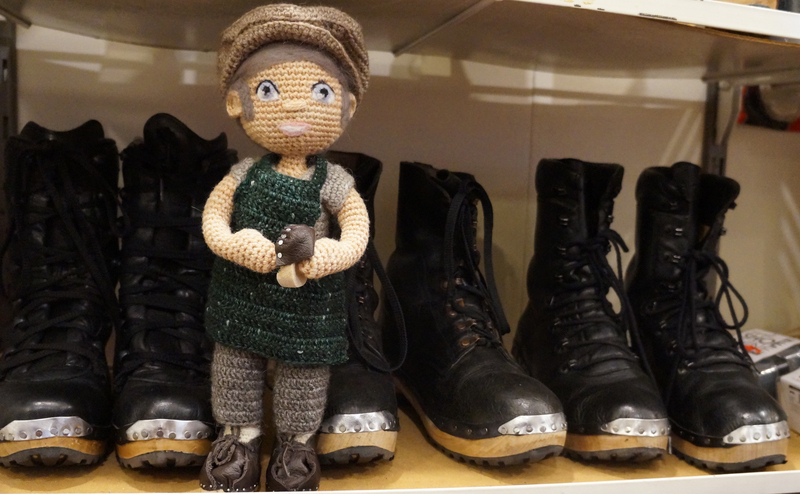 I’m sure many folk are thinking why have I made a coal miner when I’m making dolls that represent traditional crafts, and at first the coal miner was the doll I was going to leave until last. Then a few weeks ago I was with my parents and a programme was on the TV which showed a clip about the Lofthouse colliery disaster from 1973, I’d have been 1 years old (yep, I’m sticking with 35 being my current age). My mum looked up and said, ‘oh, your dad was there’. No, my dad wasn’t a coal miner, although he was a Bevin boy in the war. He was a Salvation Army officer and spent a lot of time providing support to the men during the search for survivors. It reminded me also of a time when years later, as a young Salvation Army member I was collecting money door to door in a nice middle class Lancashire area. It was during the time of the miners strikes. I remember one door opening and a man telling me he wouldn’t give to the Army because we gave to the miners. I didn’t get it being so young, but as I remember the story I decided the miner had to be made. The dolls represent traditions that are dying out or how I sometimes feel about knitting, becoming only for the privileged. When I was young, people made their own clothes because they couldn’t afford to buy ready made. Now we’re in a place where poorer folk shop at Primark and the wealthy go on sewing classes or extravagant knitting holidays. I was talking to a lady in the cafe at the National Coal Mining museum a few days ago about crafting. She told me she was a quilter and began quilting to use up all the scraps that she had left over from dress making. But then her husband spoke – describing what she does. He said she buys a yard of fabric, cuts it into pieces and sews the pieces back together to make a quilt. Quilting was once, using up your left over fabric, doll making was using up your left over wool. Now though, there is a worry that crafting is moving from the working classes to an expensive and privileged hobby. It’s not wrong though (to be a wealthy crafter) and perhaps my gripes should be for another post. 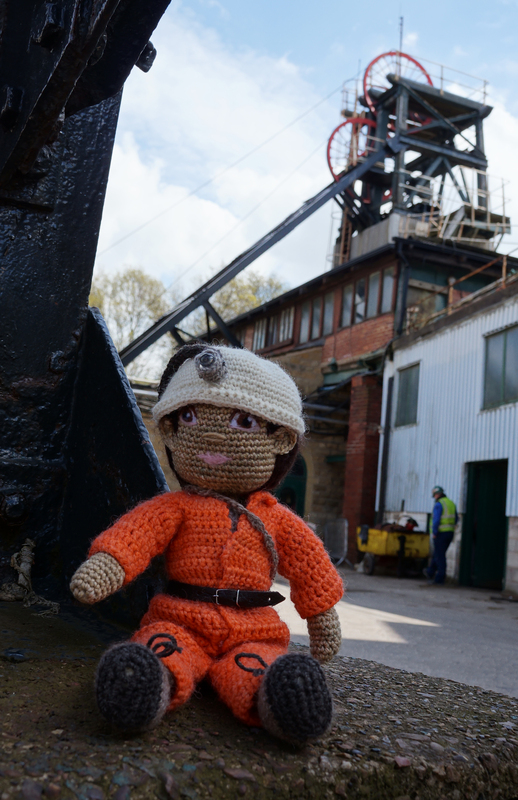 The coal mining industry is another craft (because it is incredibly skilled) that has been lost and although the dolls have been made as a celebration of Yorkshire life and craftsmanship, I wonder if, in the future they’ll be seen as a look into a forgotten past. You’ve seen pictures of him already but let me officially introduce you to William, the fisherman. As with all my dolls in my uni project he’s made from all locally sourced materials. He’s 99% wool (a wee bit of Alpaca and a pipe cleaner). He’s filled with British lambswool and a pipe cleaner (made in Huddersfield, 30mins from my home, but I picked it up on my home from Uni, so technically carbon footprint is as low as it can be. The pattern for the doll is the My Little Crochet Doll pattern that I wrote some time ago and is available on both Etsy and Ravelry. I searched worldwide for a 100% wool in flesh tones, but couldn’t find any, so I had to dye my own. I used a small dye manufacturer a little less local (Sheffield), about a 45min drive away. The yarn is Cheviot, a Northern sheep with hard wearing but mid softness, not scratchy, but will stand up to whatever a child puts dolls through. The wool is from British sheep but is spun in Huddersfield. 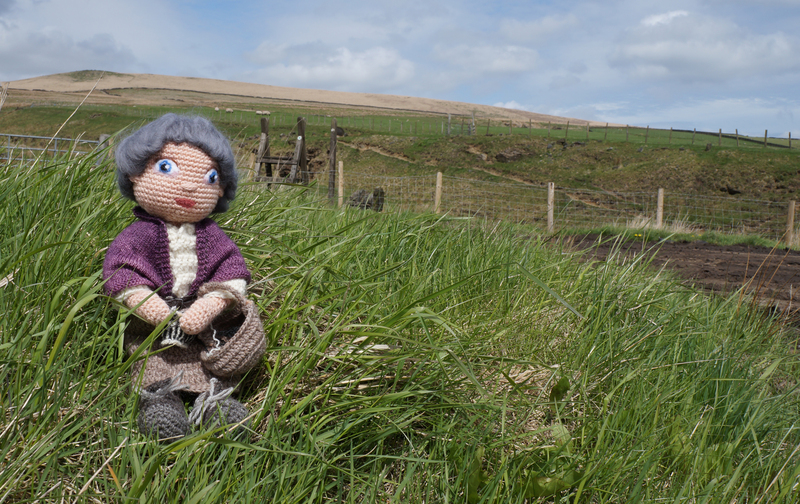 All the white, greys and brown clothing on the dolls is using a commercial yarn, Illustrious, by West Yorkshire Spinners, I used this to show off wools variety of natural shades. 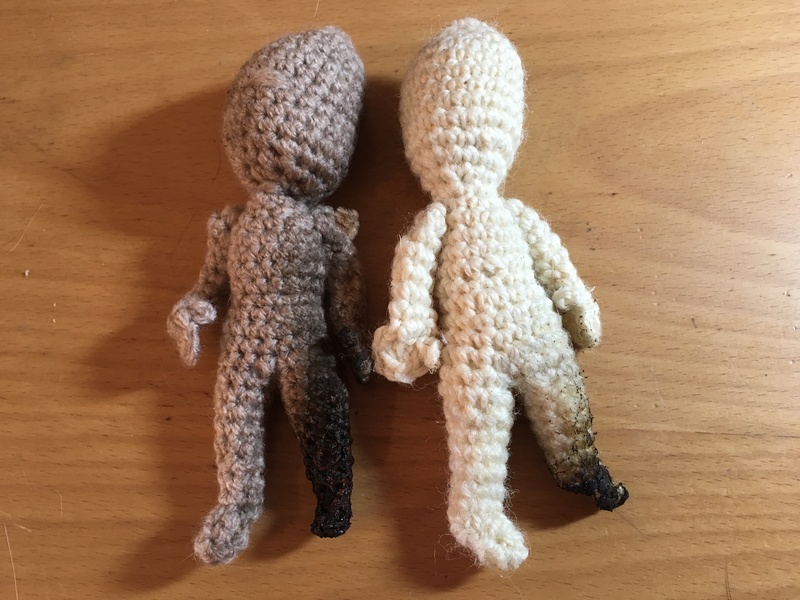 Each doll also has a dyed wool item of clothing. William has a blue traditional Gansey and a matching cable hat. The gansey includes the tradition underarm gusset and a pattern based around the Scarborough and Whitby ganseys. He is linked to the Scarborough Maritime Heritage Centre, a small museum near the seafront in Scarborough but is an amazingly friendly place to visit, They even have a Scarborough Gansey on display and several examples of gansey stitches. I’m in Scarborough hoping to get some good photos of the fisherman doll that I can use for a display. I think I’ve got some good images, but I’m using my ‘proper’ camera so have to wait till I get home to see them properly. I’m staying at the Grand hotel, which is one of those big hotels on the cliff that you look at as a child and imagine what it must be like to be rich enough to stay there. Turns out it’s not that expensive. I was a bit early for booking in so I sat on some benches watching the ocean (which wasn’t doing much). There was a couple on a bench that I thought made a nice image, they were squashed to one side and he had his arm around her. 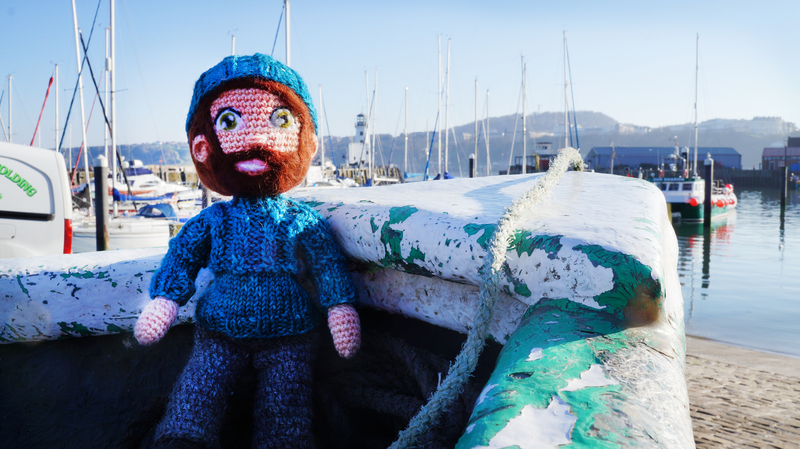 Later I went along the harbour and posed the doll against some nets. Tomorrow I’m visiting the marine heritage centre. I didn’t think I’d have the photos done tonight, so I’ve got some spare time which I’m going to spend drawing. Going to try and overcome the worry of painting in public! I’m not sure how best to use the images I get of the dolls. It all comes into the thinking of how I’m going to display them. I’ve an old set of step ladders at home, only short ones, but they’re covered in slashes of paint. My thinking is to use that as the main display to stand the dolls onto. The well used steps might add to the character of craftsmen that the dolls portray. I was thinking of adding the sketches I’ve done to one big piece and printing it off as a backdrop of Yorkshire Folk, perhaps I could print it onto fabric. As with each dolls patterns I’m almost tempted not to write the patterns down, but describe how I made the doll instead. I don’t know and would appreciate hearing whether people want the pattern… the doll pattern and most of the clothes of course is already available online, but items like the Gansey are not yet published. Should I keep these dolls as only made by me, or share with everyone? I also have to write a 50 word description of my project. What do I go with? Locally made? Bridging a gap in the market? Celebrating forgotten crafts? Lost crafts? There’s so many parts to this I don’t know which to choose.